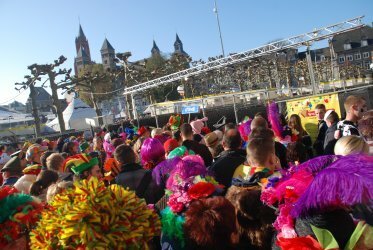 Today is Friday the eleventh of November and it means, that this year's Carneval season is about to start. Netherlands is quite popular with that, so let's have a look what the fuss is all about. Isn't it all just about opportunity to get drunk? Today is for some people special, because someone could think, that today's date is magical. Well, It looks nice I must admit that. But I am now in Maastricht and for people in the Netherlands is today also the beginning of the Carneval season. The official start was announced to be at 11:11 on 11. 11. 2011. Here in Maastricht is the central place Vrijthof, so this is also the place which was prepared for this event. How prepared? There is a big stage, kioks with beer, toilets and also fence all around. I was not sure, what I should expect and I also didn't want to be there alone, so I met there my Czech speaking friends and we went to the Carneval together. I didn't have any costume, shame on me, but I was just curious. My housemate warned me, that I didn't want to be there, because everybody is drunk there. Well, I am in Maastricht and Limburg people are crazy about carnevals, so I definitely have to see this. When I rode my bike to the city centre, I saw a lot of people heading from the Central train station to the city centre and everybody had a costume. I parked my bike at the library and walked to our meeting point. Carneval is about costumes, this is kind of obvious. I must admit, that people here really put some time and effort into it. The first impession I got, was about colors. Most of the people used red, green and yellow. I was not sure why, as national colour of the Netherlands is orange. But the main thing is, that the most popular color you can see on the steets is black. It's a conservative and universal colour, but if almost everbody wears black clothes, it's too boring. The costumes on the carneval bring change to this monotonic habit. I like it. Some of the costumes are imitation of something – characters from movies or history, an animal or fairy tale creature, but most of them are just some random costumes, people also form groups by wearing the same colors and design. And what people do? There is only Dutch music (also song originaly in Englisch are sung in Dutch), mostly no mainstream that you can hear in clubs or festivals around the Europe. I am not sure, how can I characterize it, it's kinda brass music and I would say typical for Netherlands, as I haven't heard it anywhere else so far. And people move in the style of the music and drink bier. It's 2€ for 0,25l. Typically Dutch. And as on other festivals here, you first have to buy a coins and than buy a drink using these coins. I also saw people having coupons for bier, you can buy them with your card. My freinds left and I stayed a bit longer, because I like taking pictures and this is a great oportunity fot that. The light conditions are in this part of the year very complicated,as the sun is really low and therefore there is not much space for chosing the right position for making a photo. But still, I managed to make some interesting portraits there. Just a few moments after I left, I saw another friends of mine. What a coincidence! We talked a bit and then we split up and one of them went with me to the library. Maastricht is sometimes such a small town . Article last edited 11. 11. 2011, viewed: 1423-times.